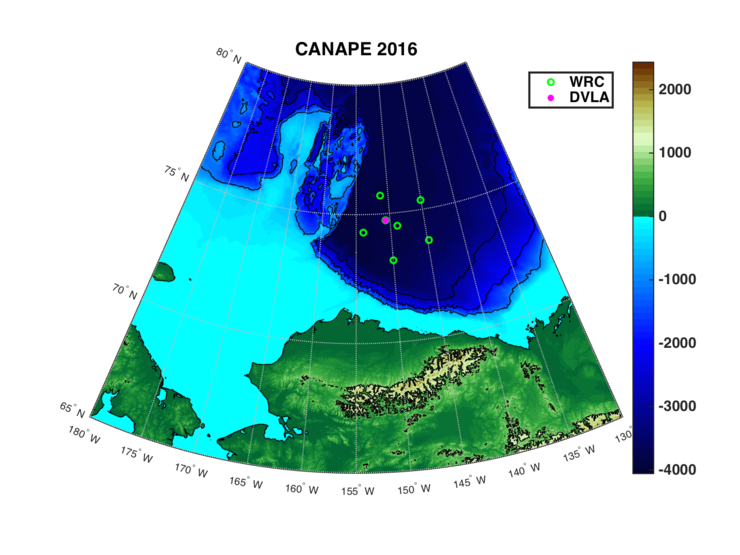 The CANAPE 2016 experiment: The moorings have been deployed in the Beaufort Sea north of Alaska and Canada for a one year period. The six receiver moorings (WRC)are denoted in green and while the Distributed Vertical Line Array (DVLA) receiver is shown in pink.US-Norwegian cooperation in the Canada Basin Acoustic Propagation Experiment (CANAPE) project has carried out a one year long ocean monitoring experiment in order characterizes the oceanographic variability in the Beaufort Sea. Ten scientists from four US institutions - Scripps Institution of Oceanography (SIO), Woods Hole Oceanographic Institution (WHOI), the Naval Postgraduate School (NPS), University of Rhode Island (URI) - as well as Post-doc scientist Dr Espen Storheim from the Nansen Center (NERSC) in Bergen, are currently onboard the USCGC Healy (US Coast Guard icebreaker). The Norwegian participation is a part of the UNDER-ICE project funded by the Research Council of Norway. The team will during a one-month period do oceanographic mapping and have recovered the seven CANAPE moorings after being deployed in the Beaufort Sea for a one-year period. The chief scientist is Dr Peter F. Worcester from SIO. In CANAPE an ocean acoustic tomographic array has been deployed that combines measurements of acoustic propagation and ambient noise. The array consists of seven moorings, placed in the shape of a pentagon as shown on the map. There are six transceiver moorings that contain an acoustic source and 15 receiver hydrophones, and one dedicated receiver mooring with 60 hydrophones. The sources transmit signals at different times and each transmission is recorded by the other moorings. The computed travel times of the signals between the different sources and receivers will in turn provide information about the average temperature along those transects. Additional oceanographic instruments, such as Acoustic Doppler Current Profilers (ADCP), upward-looking sonars, and temperature and pressure sensors, are also included on the different moorings to learn more about the oceanographic conditions and variability in the Beaufort Sea. Small-boat crew securing a line to the buoy. CANAPE Mooring recovery. A 2000 lbs Teledyne Webb Research swept-frequency source being lowered onto the deck. A hydrophone module can be seen clamped to the wire, right above the source.The moorings will be recovered during favorable weather conditions. The moorings are anchored with acoustic releasers. After localization and release a syntactic buoy rises to the surface while the mooring hangs vertically below it. The USCGC Healy moves into position and a wire is connected to the buoy from a small-boat, after which the mooring is carefully winched towards the ship. After towing the mooring for a few minutes to straighten it out, it is then winched onboard the ship and the instruments and equipment are removed as they emerge from the ocean, rinsed with fresh water, and further processed based on their specific requirements. The approximately 4 km length of wire is spooled onto wooden reels and stowed away. 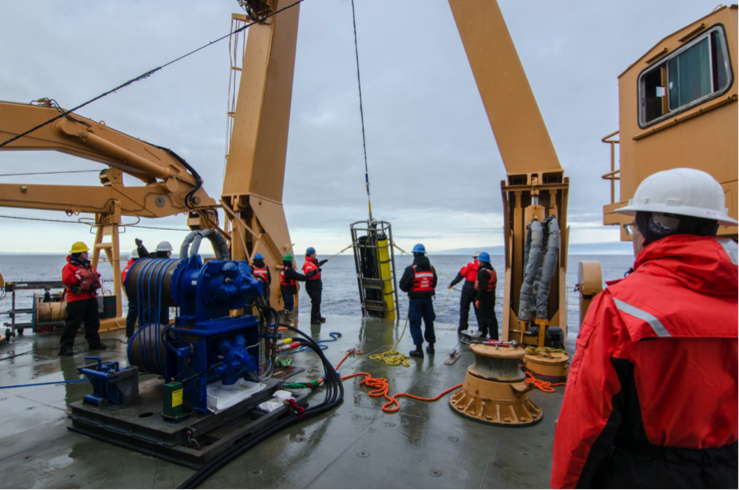 The mooring recovery operation is led by James Dunn from WHOI. His extensive experience is crucial to ensure a successful and, most importantly, a safe return of the moorings for both the equipment and the personnel involved. 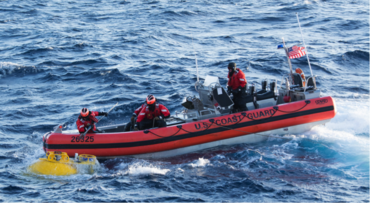 The crew of the USCGC Healy is also a great resource, assisting with deck work, small-boat operations, and in general keeping the scientific party both happy and safe.